In my last post I started to look at how we can access tools from within EA by customising the tools menu. My plan was to continue looking at accessing tools however in starting to pull together ideas for this post, I realised that I was going to be talking about stuff which may be new to some. So I thought that I should step back and, rather than continue with detail, provide an overview of the range options that exist for customising or enhancing EA. With that in place, it should make it easier to delve into the detail for each area in turn. I can then use this as a reference for my exploring (and posts). To help with the descriptions I’ll start by presenting a version of my EA programming model. I always like a picture to help me understand the components and relationships. Below is a diagram that provides my view of EA and the interfaces that it provides within the our current area of interest. So let me describe each component in turn. EA – represents the EA code, UI and all the bits I’m not going to discuss any further. The EA Object Model presents an API through which other components can access information within the EA Model and perform a wide range of tasks. It is through this interface that changes to the EA model (and underlying database are made). The EA AddIn Framework supports the use of external code (DLL) to enhance the functionality of EA. The ability to produce your own code that can be recognised and integrated with EA is a brilliant step in making EA the powerful and flexible tool it is. More on this later. The Scripting engines. EA provides several scripting engines that are accessed within the EA UI, and hence always within the context of the current EA model. These scripts can make use of other libraries which are provided as well as access external services. NOTE: Scripting is not available in the Desktop or Professional editions, and not all libraries are provided in the Corporate edition. The External Client Application represents a windows application that can connect to the EA Object Model API. The function of these applications could be varied and really only limited to the imaginative of the developer. My AddIn DLL represents the most powerful and flexible type of enhancement implemented between EA and 3rd party code. Using the EA Addin Framework the AddIn will be known to EA and becomes an integral part of the running process whose functionality defined by the developer. From this brief outline we can now look at the capabilities of the key programmable components in some more detail. Here are the basic steps to getting going with scripting. You access the scripts and script editing use “Tools | scripting”. There are different types of scripts within EA, used for different purposes. A quick look at the group menu items lists the groups that are provided – illustrated below. If you look at the scripts tab you will see scripts in these different groups. 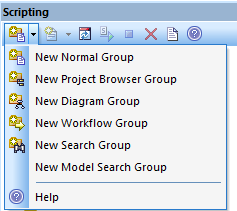 You can select an existing group or create a new group and then create a new script – as below. Note: Some groups may be read-only. If you double click or use the context menu you can now open the editor and start writing – illustrated below. ‘m not going to go into more detail at present, the point is just to illustrate how easy it is to start scripting. 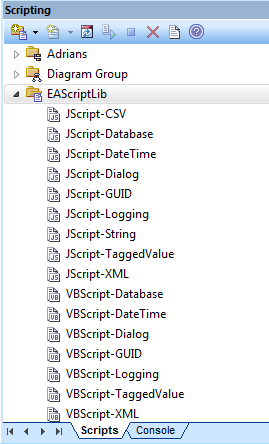 You can look at the learning centre with EA to follow through the steps and create/debug your own scripts. In addition to having the development tools to hand within EA, scripts have access to the current EA object model (referred to as EA within a script) as well as use of other supplied libraries (System and with the correct EA edition MathLib). In addition, Sparx provides, via an MDG its EAScriptLib, a set of helper functions in the libraries; list of help scripts provided illustrated below. Searches – having used simple selections or SQL – what else if anything does the script offer? 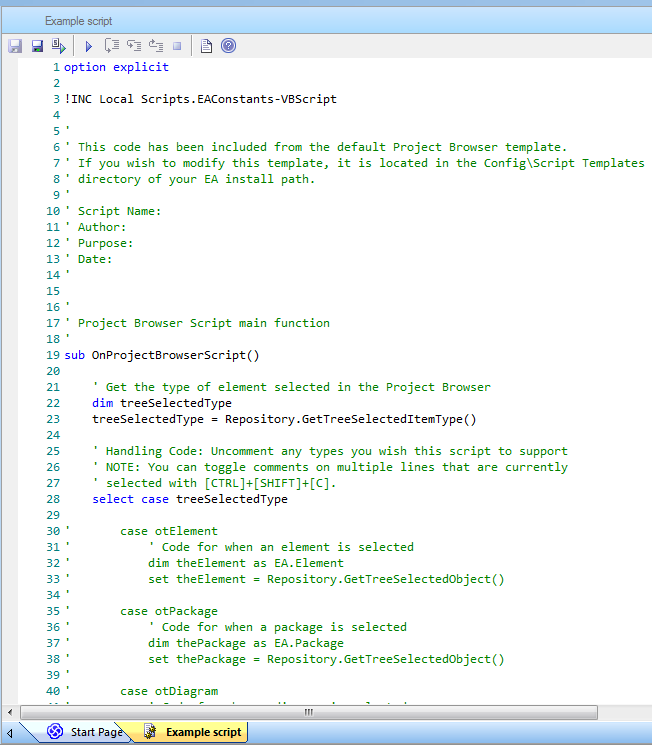 UI Interface modelling – Sparx provides some helper scripts for Win32 – so what do they do? External access – I’ve written VBA (more later) in MS Office tools to access EA. I assume it will work the other way – does it? What else can I do? Script UI capabilities – what can be done? 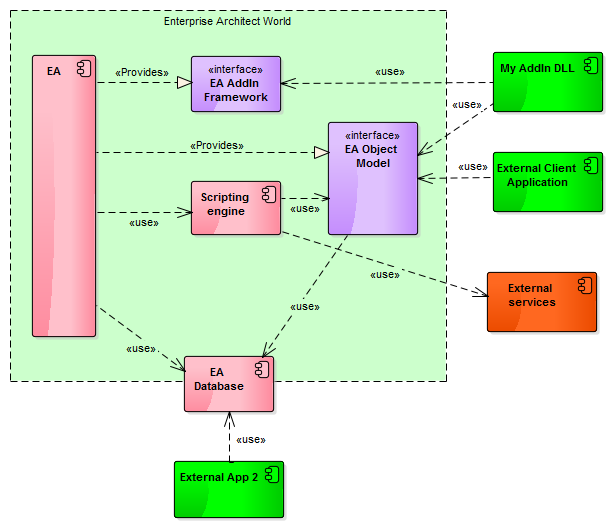 EA presents its object model as a COM service, hence any client application that can act as a COM client could access EA. Applications could be written in wide range of languages such as VB.NET, C, C++, C#, Java… A standalone client can be tailored to meet your requirements with a UI and functionality to reflect the task in hand. For example, an application could be used to support data entry from users who don’t want to or need to use EA directly, or to transfer information between an EA model and a 3rd party application. Also we mustn’t forget the power of some of our standard tools such as MS Office. These can act as client applications by using their own scripting capabilities to interact with the EA model. For example, I’ve used VBA scripts in Excel extensively to transfer information between the two tools. The biggest challenge for me was the practical task of configuration management -tracking scripts. To help with this issue you could employ an Excel (Word …) AddIns, which does require more coding, but does help. My own experience has been with an AddIn for MS-Project which provides project managers with access to information within the EA model whilst operating in their familiar environment. But what else would I want to be do with a client application? You need to ensure that any changes are complete, you may need to make changes to multiple tables, so ensure that you modify the relevant table entries correctly. Sparx may make changes to the database which will require updates to you code to work correctly. I’m not sure how one would monitor when these changes are made since it is internal to EA’s workings. Add you own UI – with your own windows/ dialogs or using EA’s Custom Views as either an EA AddIn window or an EA Tab. The fact that the AddIn exists within the current context means that, like EA scripts, it has direct access to the current EA model. An EA AddIn is developed as a DLL (Class library) that EA, if registered within windows and enabled within EA, will load at start-up ready for use. The EA AddIn Framework defines the interface which the AddIn code can implement and if specific methods are provided by your class library then EA will make calls at the appropriate time for your code to perform its task. Not only can your code work with the EA Object Model to access the current EA model it can initiate and work with other running process e.g. Excel. So if you need any of this capability you have no other choice. Although, on the downside, writing a simple AddIn may be a few hours work in my experience developing production tested products is much longer – I know since writing AddIns’s is my bread and butter! As I stated at the start of this post my aim has been to provide an overview of the capabilities EA has for customising EA and set out a road map for my explorations. Below is a mindmap summarising the areas covered with a guide to some of the areas I need to look at. If you have any related questions or topics for customising EA do let me know and, although I cannot guarantee I’ll find the answers, at least I can take a look see whilst EXploringEA. This entry was posted in API, Automation, Extensions, Object Model, Scripting, VBA on 14/10/2014 by exploringea.